The afternoon was progressing as we made our slow way down some stone steps that leads to Siquijor’s famous three-tiered Cambugahay Falls. The treads were evenly made with natural stones, probably procured from the river that feeds the waterfall. 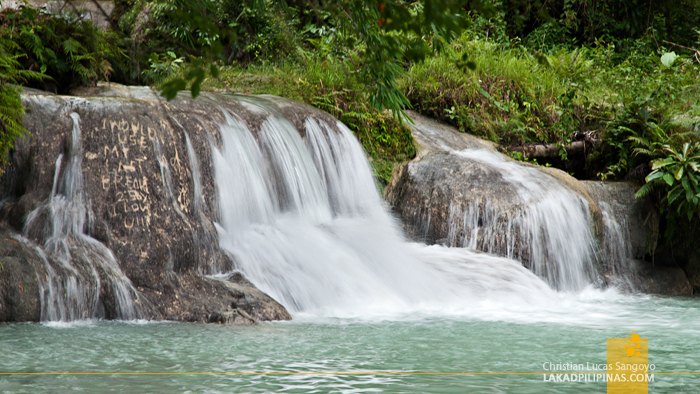 The falls cascade all the way from a small rainforest above the mountains, some freshwater springs and watersheds. A hint of light green waters, reminiscent of Palawan’s famed Kayangan Lake, slowly springs to view in between lush trees as we made our ever downwards progress. And in less than five minutes, we were holding on to our jaws, lest it fall all the way downstream with the green gushing waters of Cambugahay. I have seen quite a few waterfalls during the years and I’m not one to base grandness on height. It’s like saying the greatest basketball players are the tallest ones (as if I know a thing about basketballs, but hey, right?). It’s no Niagara Falls but for me this is by far the most beautiful waterfalls I’ve ever seen. The waterfalls were deserted except for us and a couple of very small puppies which were tailing us wherever we go. Our guide said the dogs might have been left there by the owners who probably don’t want to spend for vaccinations and stuff for the puppies; Siquijor apparently enforces a strict law regarding stray dogs. I guess the owner took comfort in leaving them in the area since Cambugahay attract visitors everyday and everyone loves dogs; these puppies wouldn’t get hungry at all. After taking my time capturing each levels of Cambugahay, I finally gave in and took a dip. The water is surprisingly warm, unlike most waterfalls. The bottom varies from soft clay to hard rocks. Huge boulders appear out of nowhere and can seriously hurt your foot, so care must be taken, especially if you’re planning to jump. Water height varies from knee-deep to more than a man’s height, with the catch basin on the lowest falls the deepest of the three. According to our guide, a company has been courting the local government to develop the area as a resort. I’m just glad that the offer has been turned down. Privatizing Cambugahay Falls would in all probability mean cottages along its banks, bridgeways in between waterfalls and concretized catch basins. We already have those in artifical swimming resorts; let’s not ruin a real one, please. It was interesting to note that unlike most waterfalls I’ve visited, there was hardly any litter in the area; so that’s another hooray for the local government. The sun is hurrying its way down as I took my final lap and waded my way to shore where the two little puppies were waiting. Another group of tourists arrived as we finished feeding the little doggies and delegated the responsibilities to the next guys. I wasn’t really expecting anything when we went down the stone steps towards the falls an hour before and I was completely surprised with what we found. Cambugahay Waterfalls’ drop may not be hundred feet high, but its small size and placid green waters makes it three times more poetic than the largest falls I’ve seen. It was still drizzling lightly as we wended our way down the 138 stone steps to Cambugahay Falls. It was my second time visiting this place, but still, I was very much looking forward to seeing it again, especially after Lugnason Falls. Unlike my first time, Cambugahay was packed when we arrived; the crowd, a combination of Filipinos, Koreans, Chinese and European tourists. A queue was forming on one edge of the first basin and soon enough, someone was propelled into the water, swooshing from a rope tied from a tree above, whooping all the way down. We went in line ourselves, waiting for our turn to do the Tarzan-style jump to the turquoise waters of Cambugahay a few feet down the natural platform. Swinging down looked effortless for those who were ahead of me, so I was a bit surprised at how much energy it took for me to hold on before letting go. Well, with my weight, I really shouldn’t have been surprised at all, lol. I knew, even from my previous outing here, that there’s a rope swing in the area, it’s actually just now that I saw where it’s located. And it’s only now, obviously, that I’ve tried it. Old places, new experiences. When I went on a solo backpack trip a couple of years ago si Joam din yung guide ko. He was really nice and I felt secure kahit mag isa lng ako. Nice guy and alam mu na he's not in it just for the money. Haha oo nga ikaw naman, ang lapit lang sa inyo nyan! super miss ko na to and ang ganda ganda ng shot mo grabe ka na! hahaha! First time kong maglambitin dyan na malatarzan nakakatawa lang! Ang gondo gondo naman ng waterfalls! 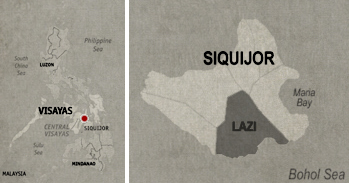 Kasama ba to sa side trip papuntang Dipolog?